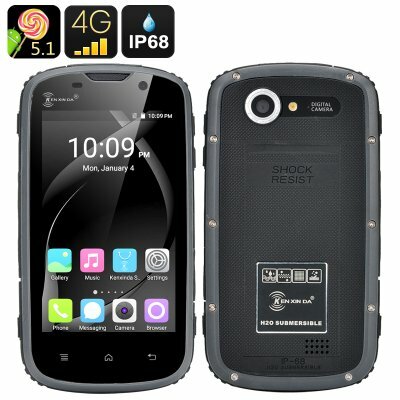 Successfully Added Ken Xin Da Rugged Smartphone - IP68, Android 5.1, 4 Inch Touch Screen, 4G, Shock Proof, Dual SIM (Black) to your Shopping Cart. The Ken Xin Da Proofings W5 Smartphone is compact rugged phone that boast triple protection as it is dust proof, water proof and shock proof. So bury it in the sand, submerge it in water or drop it on the ground and this phone will keep on going. With its quad core CPU, 1GB of RAM and Android 5.1 operating system it has a competent performance that can easily handle multitasking, web surfing and playing games. The dual SIM phone supports 2G, 3G and 4G networks so you can enjoy the fasted cellular data services around. This will make it possible to steam movies direct to the phone or upload and download information in the blink of an eye. Sporting a 4 Inch interactive touch screen brings a nice balance between size and portability so you can enjoy games and movies but be sure the phone won't take up excessive room on your travels. A 2800mAh battery will allow around 6 hours of talk time or as much as 150 hours in standby so there's plenty of time for you to enjoy all the features. If you're looking for a budget friendly smartphone that will; keep pace with your outdoor adventures but not break the bank then the Ken Xin Da W5 is a great option and probably just what you've been waiting for. It comes with a 12 months warranty and is brought to you by the leader in electronic devices as well as wholesale rugged smartphones..